I’m so excited about this new puberty book for boys, from the folks behind American Girl’s Care and Keeping of You book. I’ve recommended that book for girls so much and people have always asked about a boy version. It just came out this week, and it’s appropriately named Guy Stuff. Author Cara Natterson provides some insight as to why she wrote the book, what ages it is appropriate for, and how writing for boys is different than writing for girls. Why did you want to write Guy Stuff? Because boys go through puberty, too, and they should have the same information that girls get about how to grow up in a safe and healthy way. That was really the success behind The Care and Keeping of You: it’s not just about puberty, but about how to grow up healthfully. We have done such a good job of educating our girls, and now it’s time to educate the boys in our lives. Parents have asked me for years for the boy version of The Care and Keeping. I know one mom who bought it for her three sons and then pulled out the pages about breast development and periods—she told me that, since all the other information was gender-neutral, why not? I couldn’t agree more. So much of what’s in Guy Stuff is basic facts (boys need to know why they should shower regularly, floss, and wash their hands, too!) 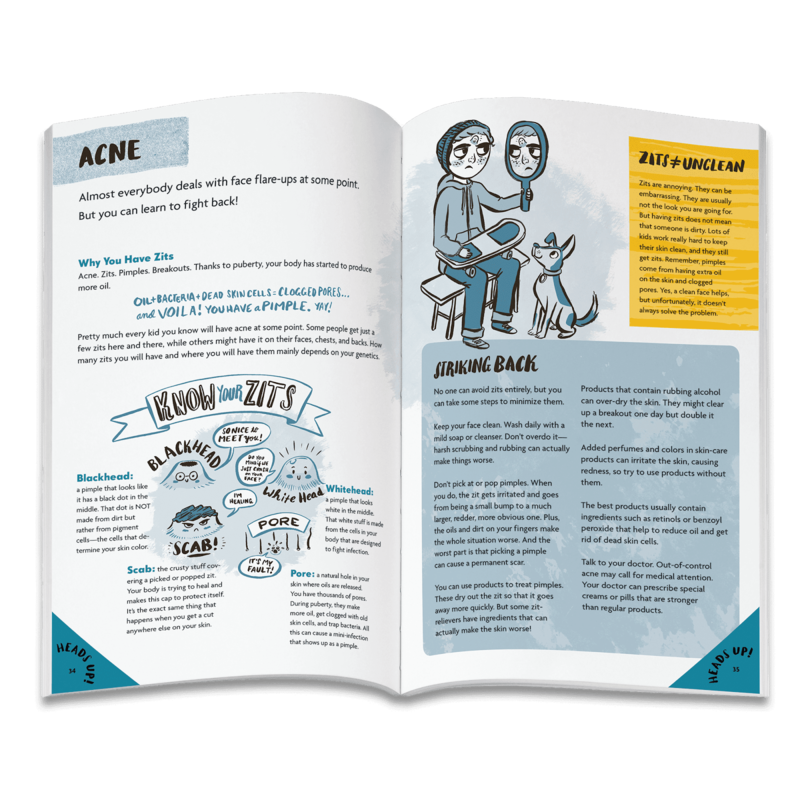 but woven into the book is also clear, straightforward information about body parts and how they will change through the tween and teen years. When should parents introduce this book to their boys? The content in Guy Stuff is appropriate for a 7- or 8-year-old boy. Just like The Care and Keeping of You, this book doesn’t have to be read cover-to-cover in one sitting. As kids get older, they will be more interested in different sections, or they may go back and reread parts of the book through a more mature lens. My 12-year-old son read it and told me he learned quite a bit…a fairly large admission when your mom is an author writing about puberty! But the basics are for everyone and, particularly when it comes to information about exercise, nutrition, sleep, and hygiene, boys can (and should!) start absorbing that information as young as possible. What do you hope the new book will do for boys? And their parents? Did writing for boys affect how you approached the content and tone of the book? Yes and no. Boys tend to communicate about these topics differently than girls—not always, of course. So yes, the tone and voice are unique. But so much of the content (in Guy Stuff versus The Care and Keeping of You) is the same because boys and girls both inhabit growing bodies that need to be cared for in similar ways. The physical management of life during puberty isn’t a boy thing or a girl thing; it’s a human thing. I love the fact that there is so much content overlap between the “boy book” and the “girl book.” As a parent of a teen girl and a tween boy, this reinforces everything I know to be true in my own house: I feed my kids the same foods, they have the same goal bedtimes, I remind (they might say lecture) them the same way each morning to wash their faces, brush their teeth, and put on sunscreen. But by-and-large, much of the information is similar because kids deserve this information regardless of their gender. What do you feel is the biggest obstacle in getting boys to talk about their changing bodies and puberty? There are two enormous obstacles when it comes to getting boys to talk about puberty. The first is socialization: we, as a society, don’t talk about boy puberty nearly as much as we talk about girl puberty. I believe this is because the first several steps along the pubertal path for boys are somewhat hidden, at least compared with girls. For example, girls grow breasts, their hips widen, they tend to have growth spurts at least a year or two before boys in their grade, and most of them become famously moody. Meanwhile, boys sweat a little more and their feet get big enough to trip over, but not much else happens on the surface right away and since they grow later than their girl counterparts, they look comparatively young. The second major obstacle is hormonal. Girl moodiness is exacerbated by the hormones governing female puberty (estrogen is blamed the most). But boy puberty is dominated by an entirely different hormone: testosterone. Many boys have mood swings, too, but unlike the girls who may laugh or cry much more readily than they used to, boys often swing in a different direction—becoming quiet and even withdrawn. This further reinforces the socialized pattern of not talking about what is going on because boys in puberty are chemically influenced not to. We cannot change the hormonal influences in our kids’ bodies, but we can absolutely change the social norms around conversation. It’s time to include boys in discussions about puberty, health and wellness beyond what may or may not be taught in the classroom once or twice a year. 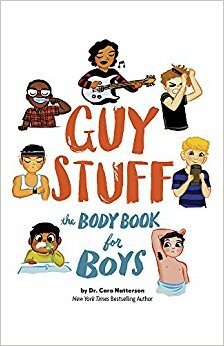 For parents who are uncomfortable talking about puberty and growing up with their sons, how can Guy Stuff help? A book is an amazing icebreaker. Some kids will want to read Guy Stuff with their parents, while others will only crack it open if completely alone. Both ways work! If you have a son who is highly resistant to learning about his body, just give him the book and let him know that it’s his resource. Make sure you have already read it and tell him so—this way, when he has questions, you can jump right to the heart of the matter, saving him further embarrassment. Some boys can’t even do that—the notion of asking anything related to puberty or the body is too much. But there’s a solution to this as well. For super-shy guys or ones unwilling to have the verbal conversation, offer up that he can write down any questions he has and you can either speak or write the answers back. This dynamic is independent of gender: there are lots of girls who are uncomfortable talking about puberty and parents report that approaching the topic this way, using The Care and Keeping books as a starting point, makes a big difference. 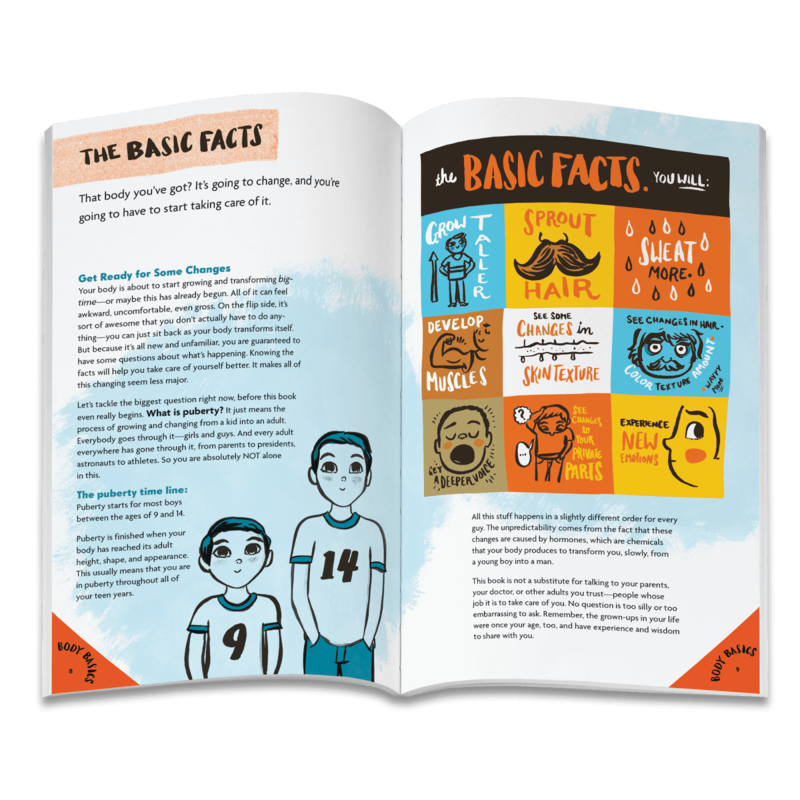 It’s critical to give boys a book that is valid and filled with accessible information. Otherwise, they will turn to online resources to fill the void. Because some boys haven’t been taught to talk about body changes in the way that girls have, I hear lots of stories about boys seeking information on their own. When boys look up a body-related question on the internet because they are too embarrassed to ask a trusted adult, they run the risk of stumbling onto untrue answers or, worse yet, extremely graphic images. And trust me when I say, if your son is uncomfortable talking about puberty, he will be 100 times more uncomfortable talking about some of the things he comes across in an online search. An age-appropriate resource like Guy Stuff saves him from wandering down that road.